My son's elementary school had Right to Read Week at the end of May. The theme for the week was the Olympics. My responsibility was to design a reading room for all the first and second grade classes to visit. I came up with the idea of "Reading the World" and found books that featured over fifty different countries. When each class visited the reading room students chose a book from the country they wanted to learn more about and read it silently while sitting on bean bag chairs or carpet squares. 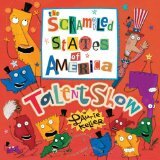 One of the books that was available to read for the United States was The Scrambled States of America Talent Show by Laurie Keller. After Right to Read Week concluded I brought all the books home. My oldest daughter was looking through them before I returned them to the library and our bookshelves. She came running over to me and said, "Dad, look at this." She showed me the end pages for The Scrambled States of America Talent Show. Kentucky says, "Hey, Idaho - you and Laurie Keller have the same birthday!" Idaho, whose birthday is July 3, 1890, replies, "Hmmm, I wonder which one of us is older?" We were so excited to learn Laurie Keller's birthday. My daughter said, "You need to write it on your calendar!" I did and we hope you enjoy our author birthday celebration for the hilarious, Laurie Keller! 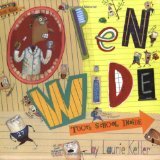 Laurie Keller is the author and illustrator of many funny books for children including Open Wide: Tooth School Inside and Do Onto Otters: A Book About Manners. She was offered a scholarship to study dance at Western Michigan University, but chose to study art and illustration at Kendall College of Art and Design. 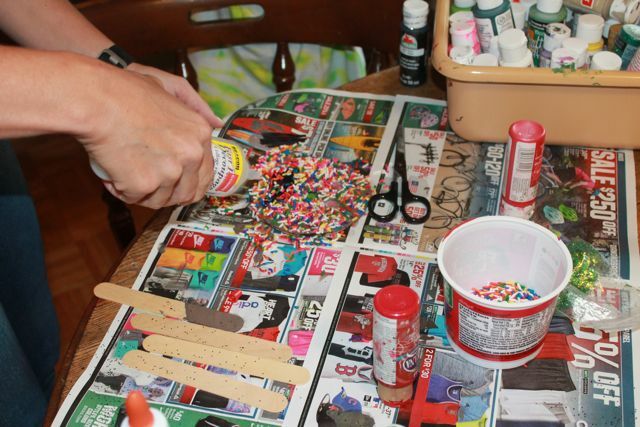 After college, Laurie worked at Hallmark Cards for seven years. 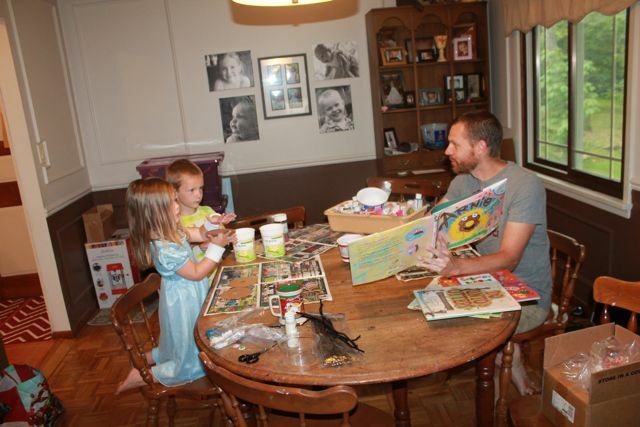 On her lunch breaks she loved visiting a nearby children's book store and fell in love with picture books. She was given a special four month assignment at Hallmark to generate ideas, write, and create art on whatever she wanted. She loved the freedom of this assignment and after it concluded she had a hard time adjusting back to her old job. She missed the "creative freedom". (Let's Get Busy Podcast). One night, almost like a dream, she had an idea of the states of America having arms and legs. 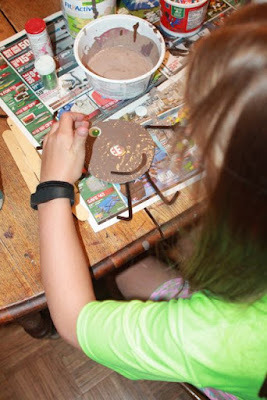 She loved the idea and put all her creative energy into developing it into a story. She said, "I would come home from Hallmark every night and work into the wee hours of the morning." (MLive). After the idea came together she set up a few meetings in New York with children's book publishers. There was no initial interest, but upon arriving back at home in Kansas City she decided that she wanted to move to New York. 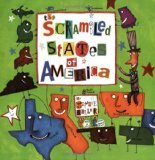 During her six month preparation for the move, she received a few rejections, but then a short time after she quit her job at Hallmark she got an offer to publish her first book which was The Scrambled States of America. Our favorite book by Laurie Keller is Arnie the Doughnut. 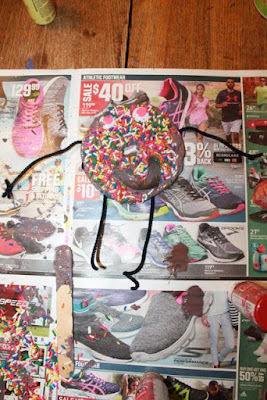 Arnie is a chocolate-covered doughnut with sprinkles and is so excited to be chosen by Mr. Bing, a regular customer at the Downtown Bakery. Much to Arnie's surprise Mr. Bing tries to eat him. Mr. Bing, who is very patient and kind, tries to explain to Arnie that people eat donuts. Arnie is in disbelief and only a phone call to the baker helps Arnie face the truth. Mr. Bing decides it wouldn't be right to eat Arnie, but wants to figure out a way for Arnie to be of some use. However, none of their ideas are stellar and Arnie says, "I guess doughnuts really are only good for eating aren't they?" and he walks out the door. It looks like a sad ending for everyone, until Mr. Bing comes up with a clever idea. My children came up with a clever idea for their end-of-the-year gifts for their teachers. 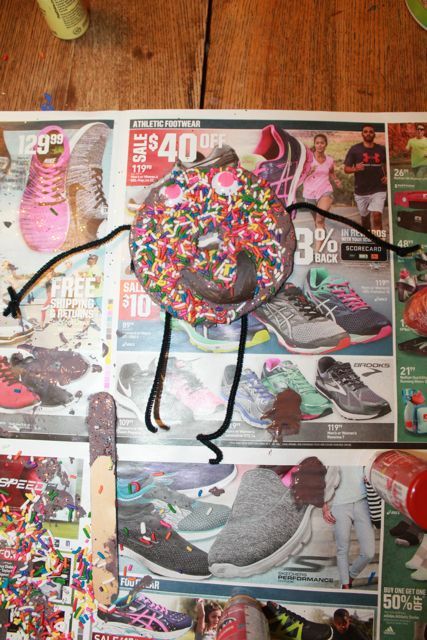 They wanted to give them Dunkin' Donuts gift cards and accompany the gift card with a hand-painted piece of cardboard that looked like a donut. They turned out so cool that I thought it would be fun to repeat the craft, but this time turn the cardboard donuts into Arnies! 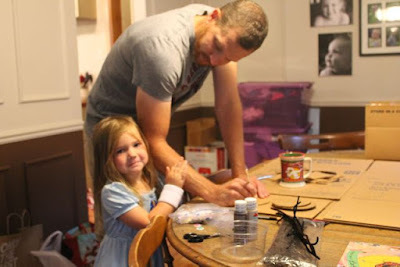 My daughter was there to support me as I got the craft supplies ready. 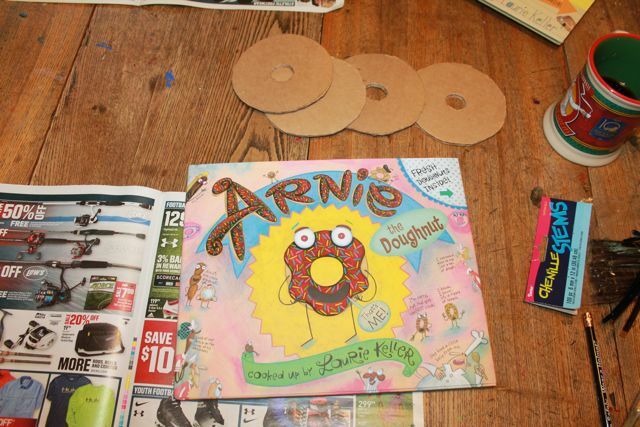 I cut the donut circles out of corrugated cardboard. Also, I had acrylic paint, pipe cleaners for Arnie's arms and legs, glitter, and SPRINKLES! 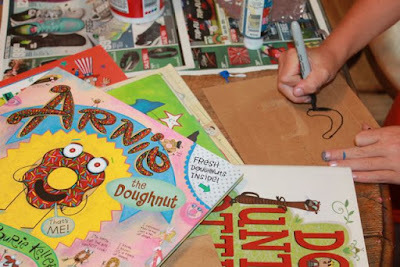 My youngest two children wanted to hear Arnie the Doughnut one more time! Did you know that Laurie Keller has written chapter books about Arnie the Doughnut? They came up with idea of squirting acrylic paint into an empty yogurt container. 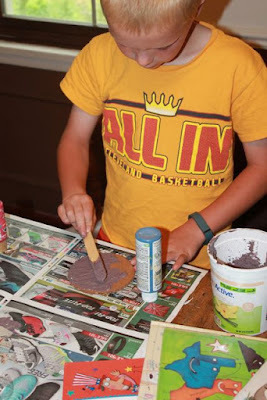 In this case it was brown paint for Arnie's chocolate icing. 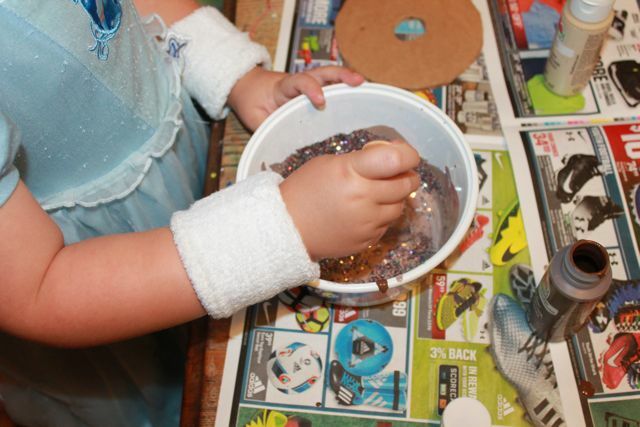 Then, he added glitter. Not a little glitter...A LOT! This made the paint spreadable with a craft stick. Big brother decided to join the fun! 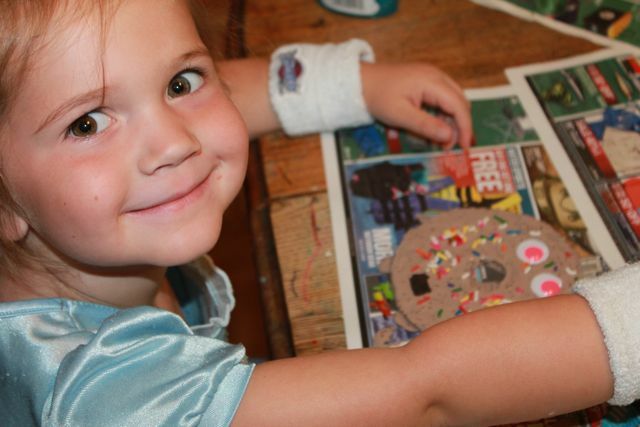 My daughter had her sweatbands on. Mixing paint is hard work! My oldest daughter joined in too. While the paint was still wet she added googily eyes. 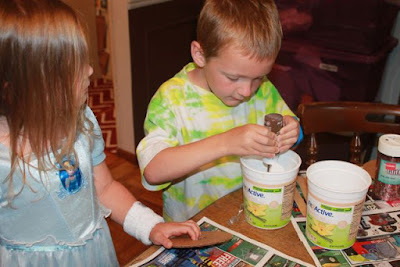 We added the pipe cleaners too. This was easy to do. We just slid the pipe cleaner into the opening in the corrugated cardboard. 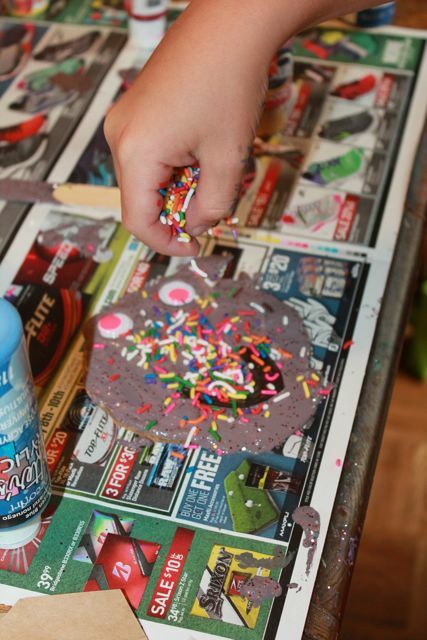 We made Arnie's mouth on another piece of cardboard with a black Sharpie marker. 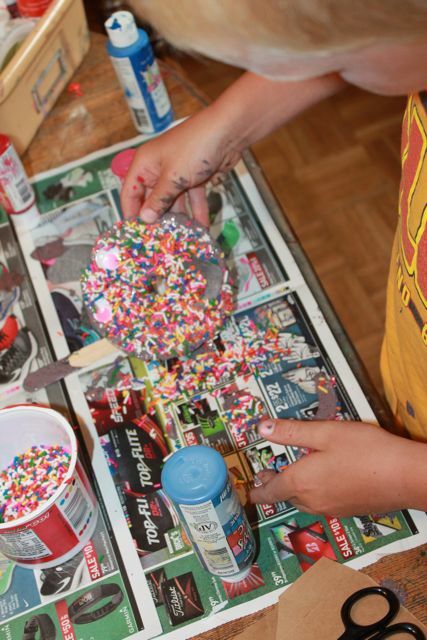 Adding the sprinkles was the most fun! He shook off the extra sprinkles. 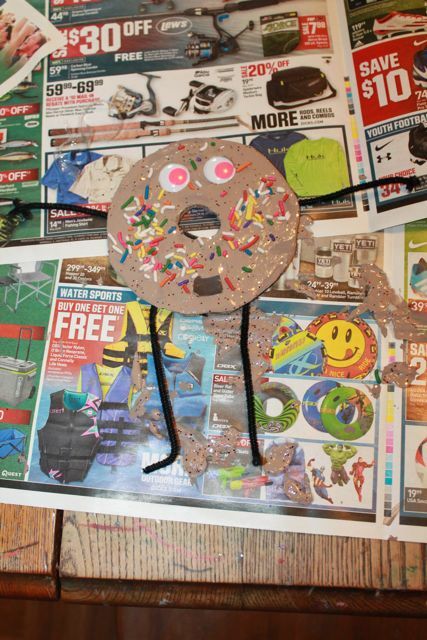 This is my youngest daughter's Arnie the Doughnut. 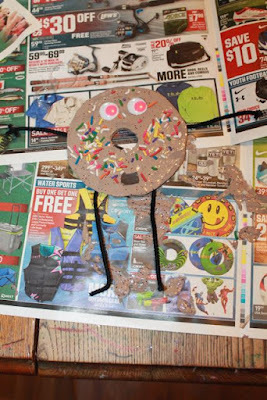 This is my youngest son's Arnie the Doughnut. It had so many sprinkles we needed to think of a way to keep them from falling off. 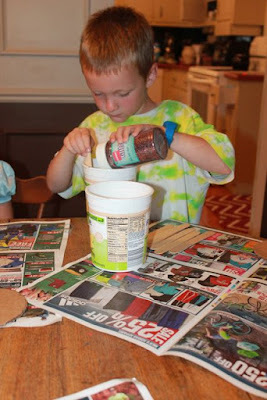 We squirted fast finish decoupage onto Arnie. 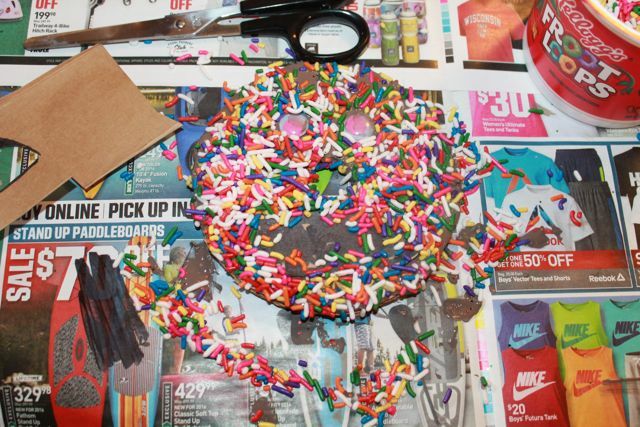 After a few applications all the sprinkles stayed in place. 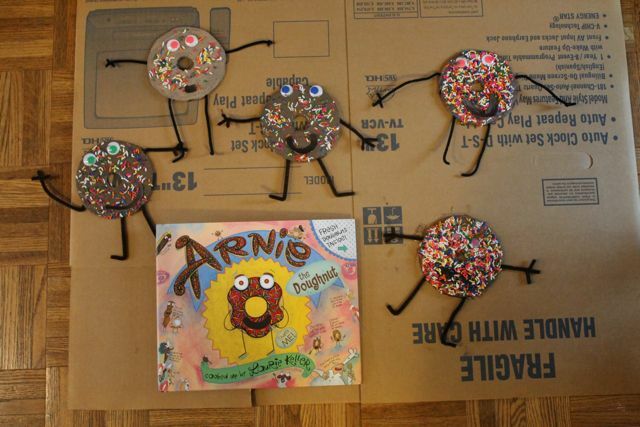 It worked out so well that we decided to decoupage all of our Arnies. 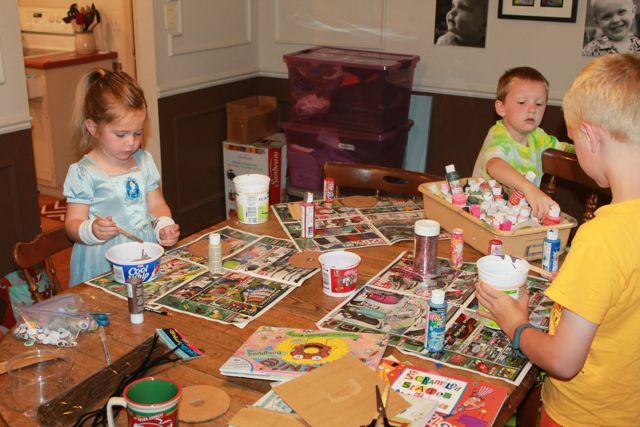 We did this activity right before all of our children went to stay at grandma and grandpa's house for the weekend. Then, my wife and I got away to Geneva on the Lake in Ohio. 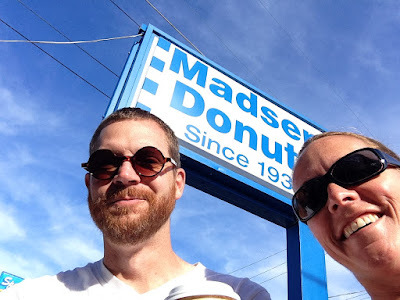 Once we arrived in town, by coincidence we were told that we had to visit Madsen Donuts for breakfast. 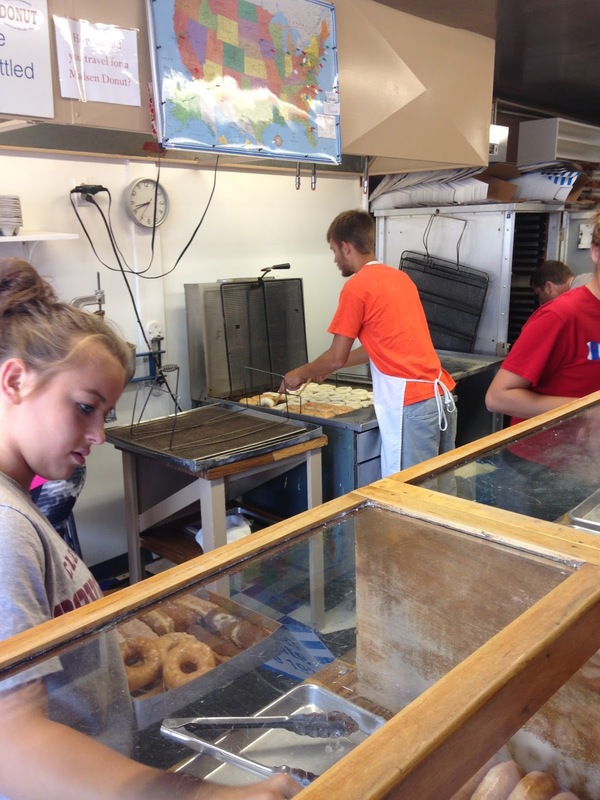 How could pass up this opportunity to visit a donut shop on Laurie Keller's birthday. 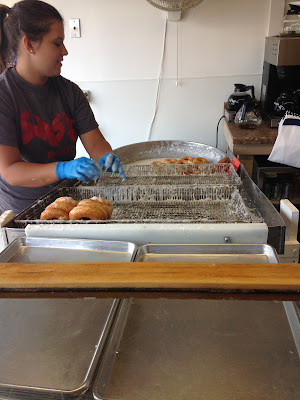 The donuts were the best I have ever had. 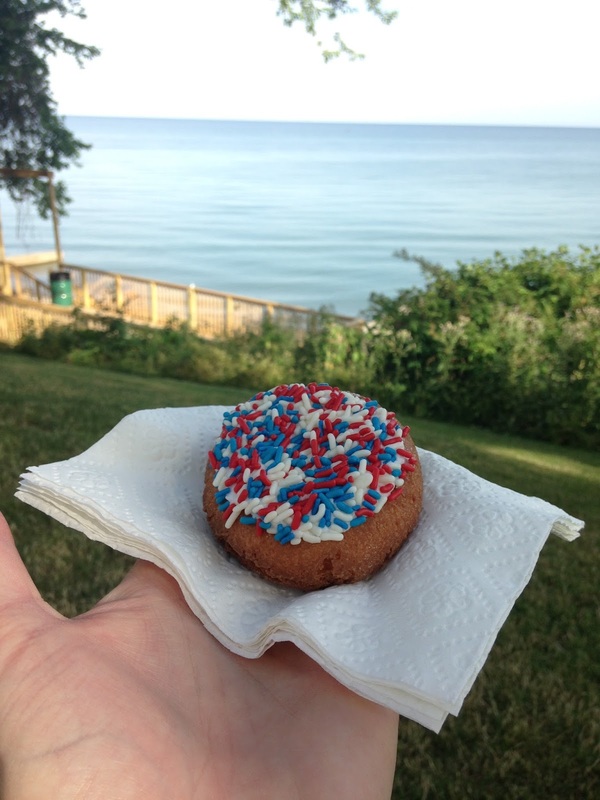 Of course, I had to get one with sprinkles! My wife loves taking selfies. I loved watching them glaze the donuts! 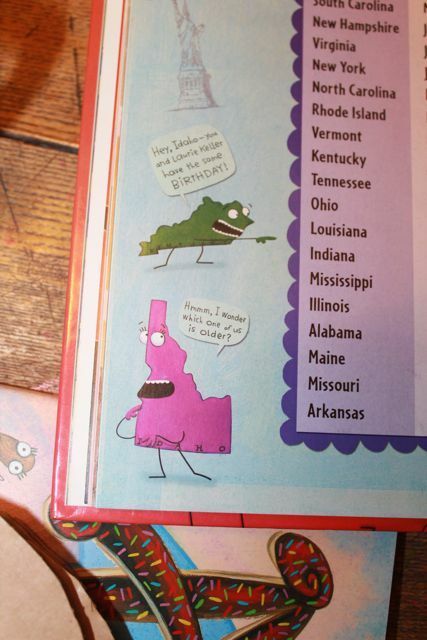 Is that a Scrambled States of America map on the wall? The best donut I have ever had! Pre-Order Laurie Keller's next book, WE ARE GROWING! It will be available in September 2016!